I shared some of the more frequented places with you from the Presidio like Baker Beach, San Francisco National Cemetery, Fort Point, and Chrissy Field in previous posts. Now I will share two new and fun things to see in the Main Post area that I was able to visit this year. Almost everyone loves going to Disneyland and Disneyworld. Northern California now has a fascinating attraction linked to these famous spots with the Walt Disney Museum in San Francisco. October 2010 is the one year anniversary of when the museum opened in the Presidio. When I recently visited the museum a few months ago, I was surprised me to find an amazing three floors of information available to browse because the building looks small from the outside. There is something for most people to be captivated when visiting. I would like to spend a half of a day in order to really read and absorb all of the exhibits. 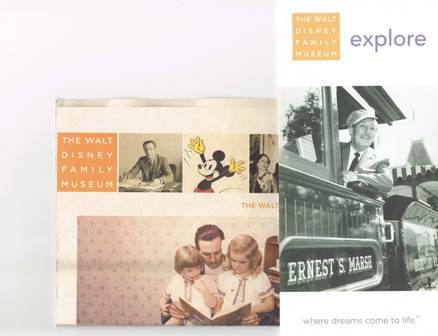 Find the ticket prices and hours at the museum website and other basic information at the Walt Disney Museum website. And with advance planning, try to visit around one of the upcoming public programs and lectures. I attended a lecture on "The Making of Pinocchio" which really was informative and fascinating to hear about all of incredible intricacies-details that went into this making this movie. And, as a bonus, I was able to see the entire movie of Pinocchio after this behind this scenes lecture. Of course, the lecture took time away from finding the special gems throughout the museum. Because the museum was closing when we got out of the movie, we were lucky to talk the really nice attendant into escorting us through all 3 floors as he was locking up. Yes, all 3 floors. 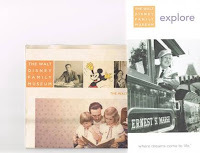 Find information about the life Walt Disney, where his hometown is, how he transitioned through the years, movies, and of course, building of Disneyland. I need to go back. Anyone ready to go with me? When? Another interesting thing to do is to go on the Main Post Walking Tour. The tour is comprised of the different buildings and locations which have been developed by the Presidio Trust. Remember to first download the map to follow from the Presidio website. The map will have the buildings marked to follow. 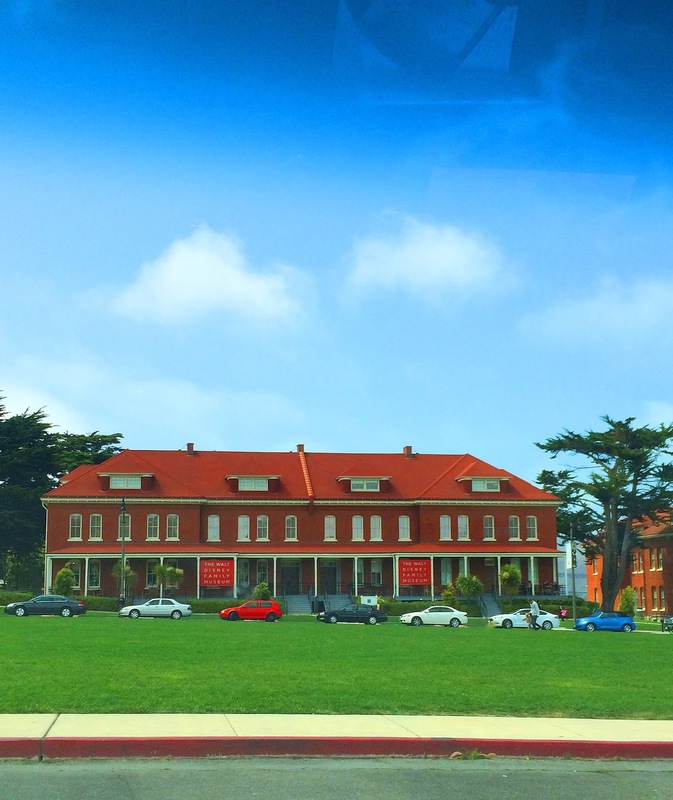 What is your favorite Presidio building? Please share your stories in the comments below. Remember my story about the unique historical building attraction in the Presidio? How many people returned to the story and read this anonymous comment answer? Some of my discoveries with my trips are well planned, yet some discoveries are at random. I was driving home to Santa Clara from San Rafael. I decided to take the first right off Park Presidio Blvd after crossing the Golden Gate Bridge. It was my intent to go west after immediately crossing the bridge, however, because of construction on the south side of the bridge, I was disappointed when I couldn’t take the closest exit off the bridge. As I drove on, through the tunnel, I found the first right turn was on Lake Street. Then I saw this significant building project tucked away off of Lake Street in an area less traveled of the 1,000 acres in the Presidio. The Old Public Health Service Hospital is perched on a hill and has really turned into a incredible attraction. I saw an uphill road leading to the building and a circle drive in front of the building. There were recently finished, excellent groomed, landscaped grounds with grass and plants around the building; the landscaped grounds continued to the large vacant parking areas in the front and sides of the building. After I stopped at the bottom of the hill to get my first picture, I saw that there were no locked gates, so why not continue up the road which winds around in the Presidio? Of course this area is not on a standard San Francisco tour, although, I do know a tour company which caters to taking small groups (5-6 people) to areas like this one I found. Yes, the article brings back memories to me about what was taking place which I had forgotten about until now. Today this is now the upscale Presidio Landmark residence and an amazing historical building attraction available to live in. This particular area is known as the Public Health Service District as named by the Presidio Trust. I am very excited to share this rag to riches story for this old building project and the transition. I like to see the historical emphasis kept in our region as it has been through this project. It means to me of our progress through the years. I found an interesting demolition project slide show that happened in 2008. People may remember two wings that were attached to each side of this building – the wings were built in the 1950s. Now, there are 154 residential apartments. Ah and yes, I was busy taking pictures of the building, however, when I turned around.......I paused.........to see the amazing and beautiful scene of the Pacific Ocean, waves surging on to the shoreline. I never get tired of this image! Remember, to always turn around! Take the time to wander through the Presidio Trust grounds when visiting San Francisco. Go see the restored Presidio building attractions – a must see to walk or drive around. These grounds have always had a military influence, from early days of the Spain, Mexico, and the USA. I do remember there was quite a bit of conversation in the mid-1990s after the Sixth Army was inactivated and the Presidio was turned over to the National Park Service. And thanks to an act of Congress in 1996, the Presidio is now under the management of Presidio Trust, a US Government Corporation. Up Next .... check back for my favorite “Don’t Miss” attractions I found in the Presidio this summer! Share your favorites with us in the comments below! Pictures from 'Off the Beaten Path"
I am sharing a few more unusual recent pictures with you. I am lucky this year to be able to explore north, west, south, and east around San Francisco bay. Are you interested in sharing your favorite insight and experience? Leave a comment or send an email. Don't worry about not being a writer – I will help you. Everyone has a story. 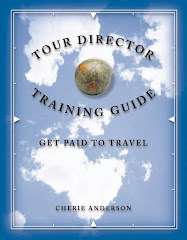 I am looking for international and domestic regional stories. 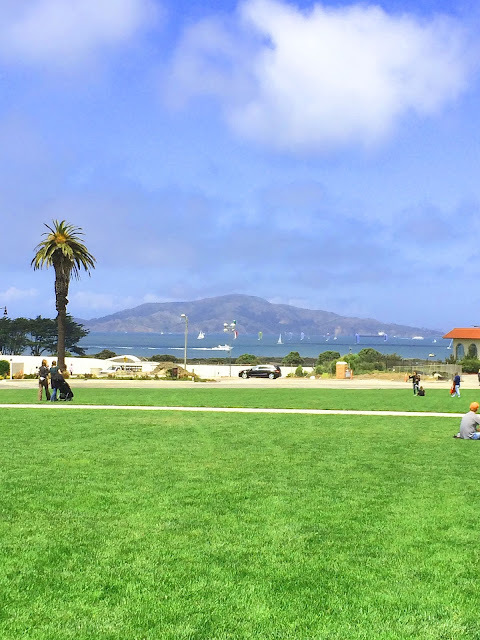 Enjoy these views around the city of San Francisco - same photos from yet a different location! Guess where I am? Do you like this story? Tell us below in the comments. Click to Contact Us page and send us an email.